This is a short release note for version 5.0.0 of the Paystack WooCommerce Payment Gateway. Two major features were added in this version, support for Paystack custom filters and creating additional Paystack gateways. Create additional Paystack gateways (maximum of 5) using different custom filters. Paystack custom filters allows you to control how a transaction is completed. Using Paystack custom filters you can specify the payment channels, the card brands and the banks card that can be allowed for a transaction. Some usage example of Paystack custom filters are listed below. Accept any card brands (Mastercard, Verve & Visa) from some specific banks. 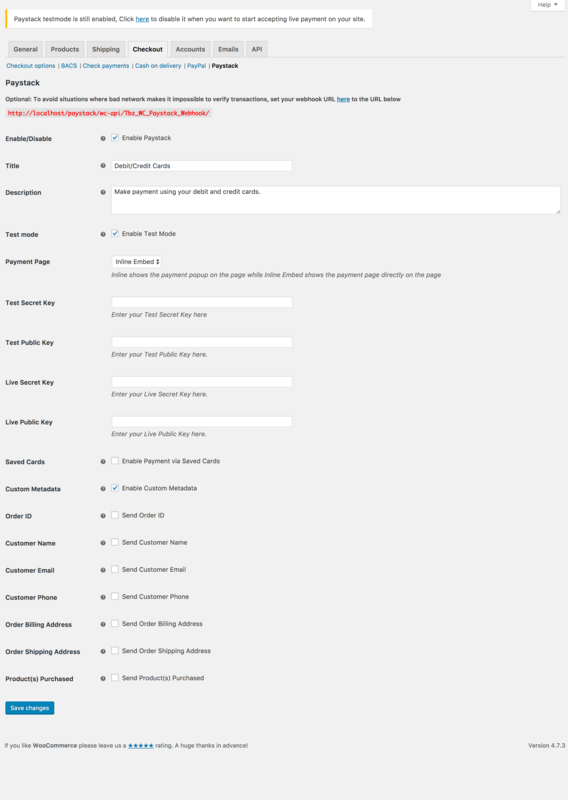 You can now create additional Paystack gateways (maximum of 5) from the settings page. This additional Payment gateways allows you to use Paystack custom filters to control how a transaction is completed. Once you have selected the number of additional Paystack gateways to be created and click on the Save changes button the additional gateways will be displayed on the payment options. Each of these additional Paystack gateways can be customized using Paystack custom filters where you can set the payment channels (cards, banks) , the card brands ( mastercard, verve, visa) and the banks card that can be accepted for the gateway. 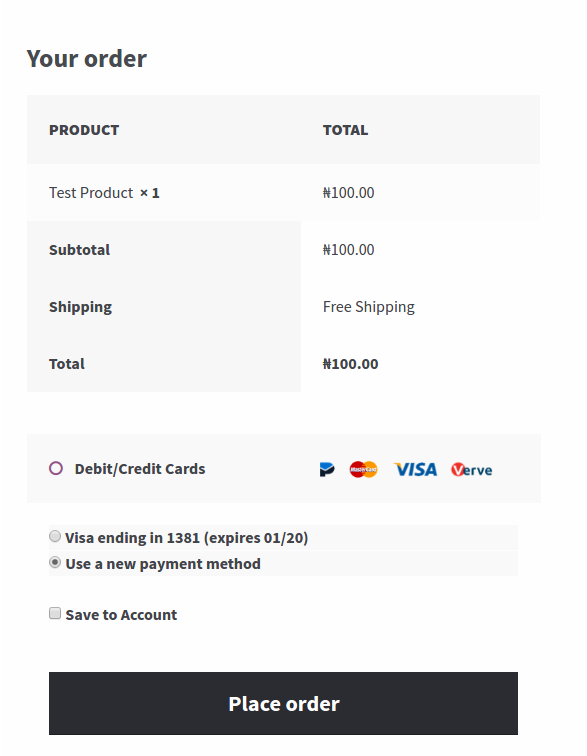 You can also set the payment icons that will be displayed on the checkout page. Selected payment icons for an additional gateway displayed on the checkout page. 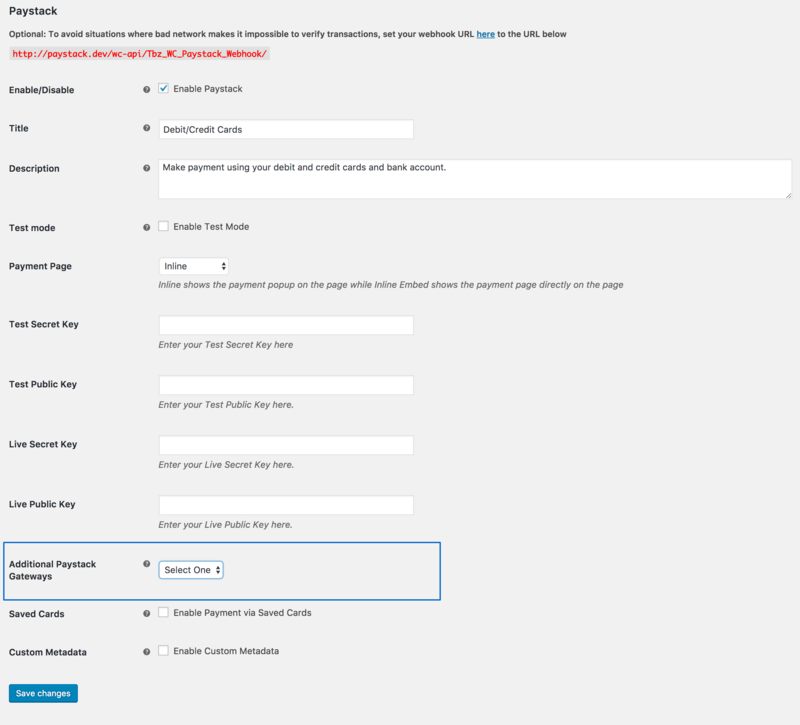 The main Paystack gateway can be disabled and only the additional payment gateways enabled for your site. Contributions are always welcome. If you will like to contribute to the plugin, feel free to fork the repo on GitHub and submit a pull request with your changes. If you have any issue using the plugin or want a feature to be added to it feel free to contact me by clicking here. This is just a short release note for version 4.0.0 of the Paystack WooCommerce Payment Gateway. Two major features were added in this version, support for Paystack Inline Embed and Custom Metadata. Paystack Inline Embed allows you to show Paystack payment page directly on your site instead of the current popup option that is currently used. The popup option can still be used. 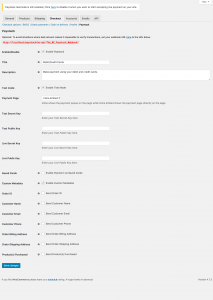 To use the Inline Embed just select Inline Embed in the Payment Page option in the plugin settings page in your WordPress admin. 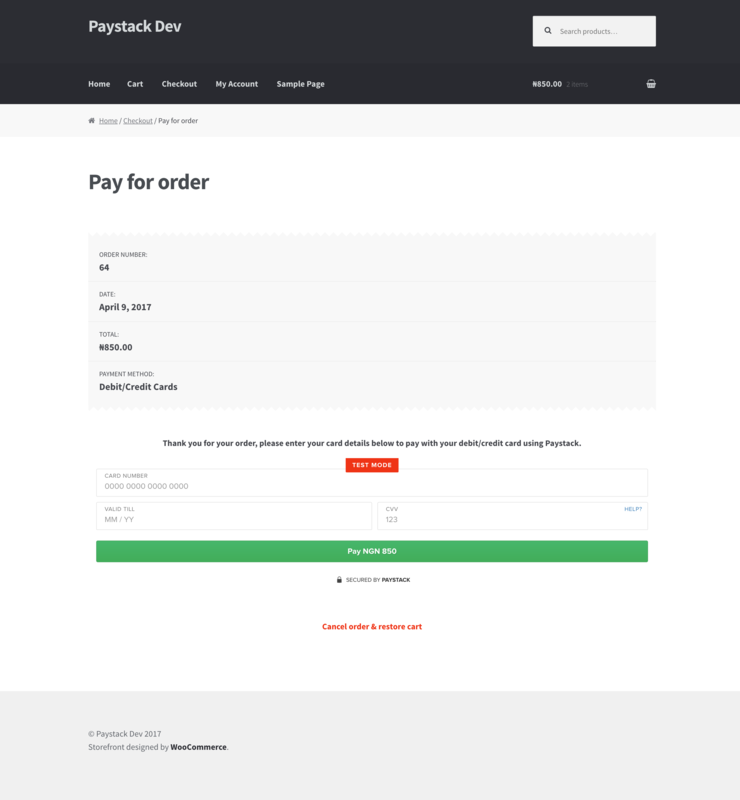 With the custom metadata you can now send additional information to Paystack about the order. This will be displayed when viewing the details of a transaction in your Paystack account. You can now edit the title that is shown on the checkout page and also set a description that will be displayed for the user. Initially the title was set to Debit/Credit Cards and it wasn’t editable. WooCommerce 2.6 “Zipping Zebra” was released on 16th, June 2016 and one of the new features added is the Payment Token API which standardized the way in which tokens are stored and displayed. With this new feature a payment token/authorization code from Paystack can be saved when payment is made by a customer and subsequently use to make payment for subsequent orders by the customer. 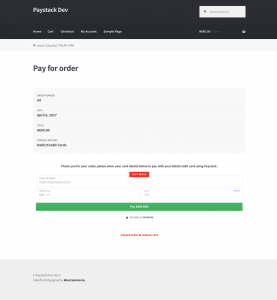 Version 2.0.0 of the Paystack WooCommerce Payment Gateway now allow a customer to save their card details on Paystack servers when placing an order and anytime they come back to shop they can just select that saved card and use it to pay for an order without entering the card details again. NOTE: Card details are saved on Paystack servers, not on your store. To be able to use the saved card feature on your site you need to have WooCoomerce v2.6 or higher installed and a valid SSL certificate installed on your site (you will need to contact your host about installing a valid SSL certificate). A customer can also delete any of their saved cards from their account page. And lest I forget I will like to say a big thanks to everyone that uses the plugin. 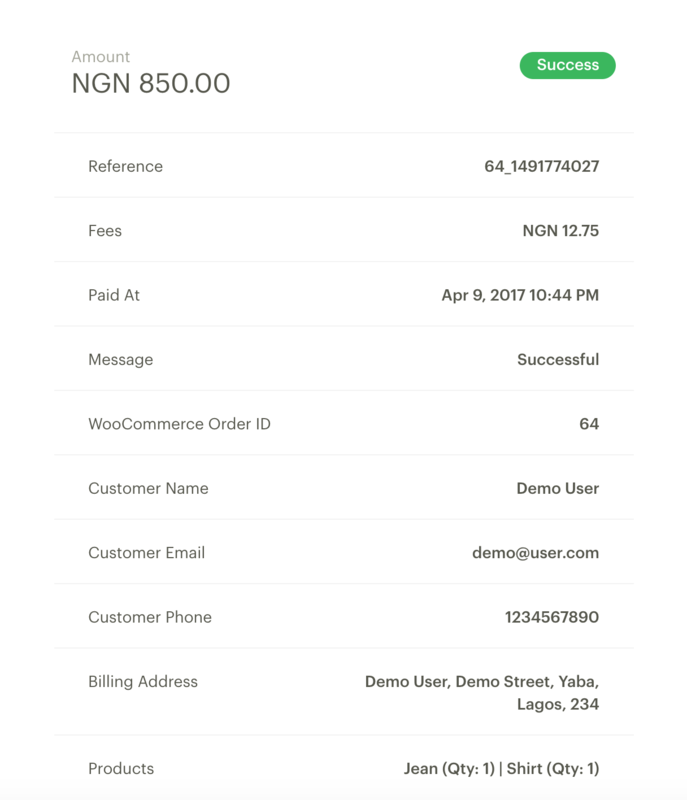 Four weeks ago I launched Jusibe.com an SMS API service. 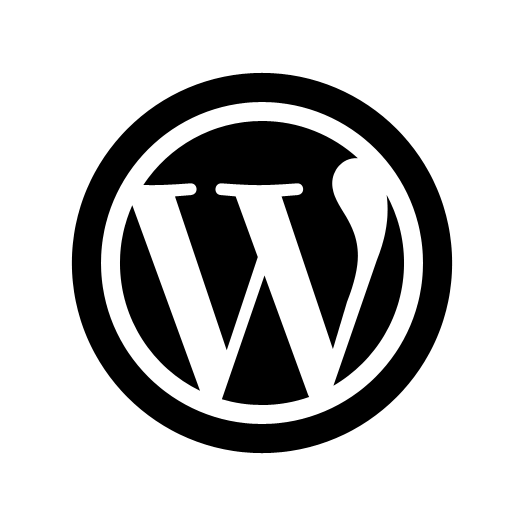 Jusibe.com is an API service that allows you to send SMS on your websites and applications using a simple and easy to use REST API. Jusibe.com is not a bulk SMS site, as you can’t send SMS directly from our platform, we provide you with an API that you can integrate directly into your website to send SMS. Sending SMS from your websites or applications will be made easier using the libraries, extensions & plugins that are currently being developed. Presently only Nigerian mobile numbers (glo, airtel, etisalat & MTN) are supported. For a limited time 250 free SMS credits will be given out to everyone that registers once your email address and phone number has been verified. Reviews, comments and suggestions are welcome. It’s been a while I released a free plugin for the WordPress ecosystem, so I decided to work on one. Easy Digital Downloads – Slack Notification plugin send a notification to your Slack channel anytime an order is marked as complete on your Easy Digital Downloads store. Easy Digital Downloads is a plugin that allows you to sell digital downloads on your WordPress site. Contributions are always welcome, if you will like to contribute to the plugin, feel free to fork the repo on GitHub. Over the weekend Voguepay launched their new global payment platform. I have been getting mails from people using the plugin asking if my Voguepay Woocommerce payment plugin will still be compatible with the new Voguepay global payment platform that just launched. Immediately after the new Voguepay global payment platform was launched I tested the plugin to make sure it is still working perfectly, but discovered it wasn’t working apparently the new global payment platform broke how the plugin works. Immediately I fixed the issue and released an updated version v2.0.3. Basically the problem was with getting the details of a transaction from the Voguepay payment notification API. After the release of v2.0.3 of the Voguepay Woocommerce payment gateway plugin I discovered that I forgot to remove an extra line of code that I was using to test the if the payment notification still works and this prevented an order status to be updated once payment was made. This was a mistake on my part, will be more careful next time. This has been fixed and a new version has been released v2.0.4 which now works perfectly. So if you haven’t updated to this version I will recommend you do that right away if you don’t want to encounter any problem using the Voguepay Woocommerce payment gateway plugin on your Woocommerce powered store. Am working on releasing a new update before the weekend to bring support for the new features that Voguepay has added in their global payment platform. So be on the lookout for it. If you have any issue using the plugin or want a feature to be added to it feel free to contact me via the Get In Touch link at my site or by clicking here. And lest I forget I would like to say a big thanks to everyone that uses the plugin. Yesterday I released an update to the AffiliateWP MailChimp Add-On version 1.0.4 to be precise and forget to add the MailChimp class file while tagging the new version which resulted in people sites begin broken after updating to this version. It is our job as WordPress developers to fully verify and test our WordPress plugin whether it is free or paid before releasing it, after releasing it and after releasing an update to it, to make sure everything is working perfectly. There is nothing as painful as your site being broken due to a plugin. I know how it feel. People that updated to version 1.0.4 of AffiliateWP MailChimp Add-On couldn’t access their WordPress dashboard because of the MailChimp class file that wasn’t added in the release and was needed in the plugin. After releasing the update (v1.0.4) I went to bed not knowing that the MailChimp class file wasn’t added in the release. I woke up around 2:00 AM and saw some notifications that the plugin update wasn’t successful and breaks the site after being updated. @tubiz the update to the AffiliateWP mailchimp plugin doesnt successfully update. Immediately I quickly added the MailChimp class file to version 1.0.4 and thereafter released version 1.0.5 to fix the problem. Am so sorry about this and take the full blame for breaking your site due to am error on my part. I will be more careful next time and verify that all files are added before tagging a new release. If you haven’t updated to this version (1.0.5), kindly do that. Interswitch Webpay Woocommerce Payment Gateway allows you to accept payment on your Woocommerce powered site via the Interswitch Webpay payment gateway. 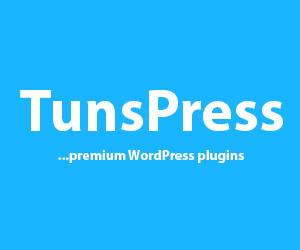 The plugin is now available to download and use on your Woocommerce powered store, to install the plugin, download it from the WordPress plugin directory or install it from the plugin section in your WordPress admin area. Just search for Interswitch Webpay Woocommerce Payment gateway. Since the first version of the Voguepay Woocommerce Payment Gateway plugin was released on the 28th of January 2014 it has been downloaded over 1100 times. Looking at the download statistics of the plugin everyday and seeing the number increasing daily just gives me joy that it is being downloaded and used by Nigerians that needs to integrate a payment system in their Woocommerce powered store. The last version of the plugin that was released was v1.3.0 and it was released two months ago on the 20th of April 2014. To read about the changes in the previous version, you can read the blog post about it here. I am pleased to announce v2.0.0 of the Voguepay Woocommerce Payment Gateway plugin. In this version of the plugin one new feature was added and an existing feature was rewritten. Fix: Fine tuned the IPN (Instant Payment Notification). Immediately a payment transaction occurs a notification is sent by Voguepay to your site. This allows an order payment status to be updated real-time as soon as a payment transaction occurs and before a user is redirected back to the site. And to the main feature of this release, in the previous versions of the plugin when a customer is redirected to Voguepay to make payment with either their Voguepay account, MasterCard, Visa Card or Verve Card, if the transaction is successful or not before the payment status of the order on the store is updated the customer have to be redirected back to the site. This have been fixed in this version as soon as a payment transaction occurs an Instant Payment Notification is being sent to your store before the customer is redirected back. This allows the payment status of an order to be updated real-time as the payment is being made whether the payment transaction is successful or not. 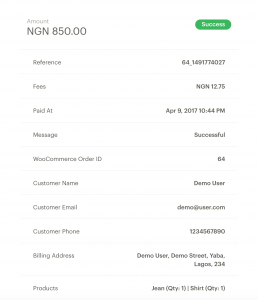 Before you start accepting payment on your site, login to your Voguepay Account go to Account Preferences then API Settings, then set Enable notification API and Send Transaction ID to Success and Failure Return URL to Yes. Then click on Save Changes for the changes to be effected. It is very important that you do this before you start accepting payment on your site. You can view the entire changelog for the plugin since when it was released here. The last time an update was pushed to the Voguepay Woocommerce Payment plugin was two months ago, exactly on the 19th of February, 2014, that’s over two month ago. When I released this plugin way back in January, I decided that this plugin will be updated regularly and supported. 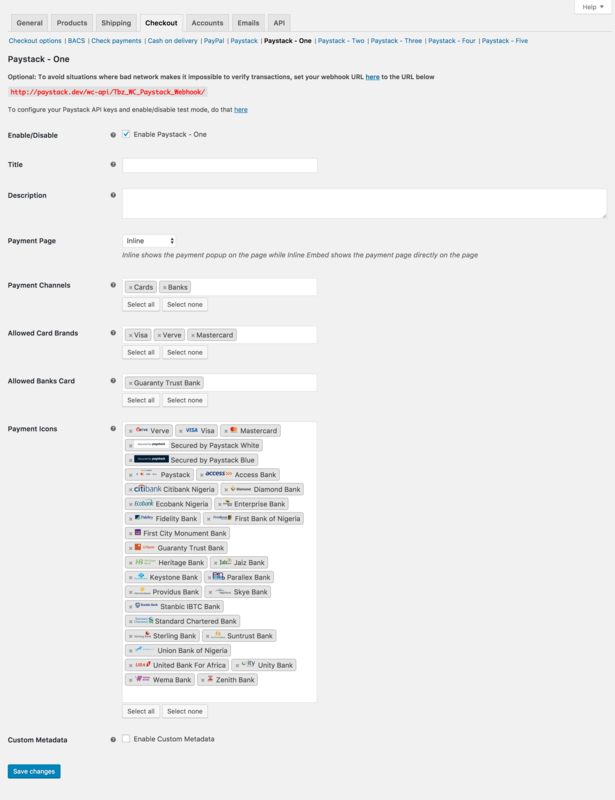 I am pleased to announce v.1.3.0 of the Voguepay Woocommerce Payment Gateway plugin. In this new version v.1.3.0 two new features were added and one fix was done to the plugin, they are listed below. Before this version stores that sells downloadable products and process payment using the Voguepay Woocommerce Payment Gateway plugin, all order status are set to processing, setting an order status of processing after payment is made is suited for stores that sells physical products and needs to package and ship products once payment is received after which the order status can be changed to completed once the order is delivered and received by the customer. But for stores that sells downloadable (digital) products, this isn’t the case as orders are not packaged and shipped after payment is made but a link to download the product is sent to the customer or via the customer’s account page once payment has been received. So there is no need for an order that contains downloadable (digital) to have a status of processing after payment is made rather it should have an order status of completed. So this version fixes that. For stores that sells physical products after payment an order status of processing is set but for stores that sells downloadable (digital) products an order status of completed is set. I also changed some deprecated Woocommerce function. You can view the entire changelogs for the plugin since when it was released here. Happy Easter to you all even though it’s late.